On a hot July day in 1923 northern Montana served as the unlikely backdrop for a boxing extravaganza on the international stage. There on the plains right outside the City of Shelby, Jack Dempsey defended his World Heavyweight Boxing Championship against the hard-hitting Tommy Gibbons – the only world championship fight that Jack Dempsey ever fought that went the full fifteen rounds. Local boosters lauded the bustling town near the Canadian border as the Tulsa of the West and built a 40,208-seat stadium to host the match – the biggest outdoor arena in America at the time. But there on Champions Field the “gladiatorial battle” between Dempsey and Gibbons was fought amidst ticketing problems reminiscent of the modern day Woodstock Festival. Reports throughout the last days leading up to the fight cast doubt on the event. And even though Jack Dempsey stepped in to assure organizers that a bout would take place, the damage had been done. Rail services had been cancelled for special trains, advance reservations cancelled and fight fans stayed home. In the end, only 7,702 paying fans showed up. An estimated 13,000 people got to see the fight free. Today a local group of dedicated citizens are working hard to build a park on the original fight sight with a full size ring holding life size bronzes of Jack Dempsey, Tommy Gibbons and the referee. Kiosks throughout the park will depict pictures and audio highlights recounting fight events as well as feature the history of northern Montana homesteading, the oil and gas industry and the railroad. The fighting spirit lives on in other ways in Northern Montana as four-term Mayor Larry Bonderud (Shelby, Montana) and other civic leaders step into the ring of economic development on a daily basis. 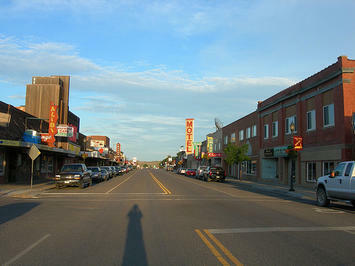 Shelby, the County seat of Toole County, is a small community that thinks and acts big. Led by Mayor Bonderud and supported by a strong cast of local and regional civic and business leaders, the city has set in play a diverse, aggressive and successful approach to economic development focusing on attracting young families by bringing new businesses, industries and family wage jobs to the community. This approach is paying off, with the city realizing a 6.31 percent population increase since 2000. Capitalizing on long-term vision and an entrepreneurial approach to economic development, Shelby has been successful in attracting and growing business and employment opportunities within the city and county. Going back ten years, in an effort to grow job opportunities in the region, the city worked to attract a private adult correctional center near the city. Fast forward to today, the Crossroads Correctional Facility is the top private employer within the county with over 150 employees. Always the promoter, Bonderud suggests that “We’re one of the safest counties anywhere,” noting some 230 correction officers, Border Patrol agents, local police and regional FBI and Montana Highway Patrol officers who work in the county with 5,100 residents. The community continues to work on growing its industrial base by expanding its industrial park, capitalizing on its growing wind energy developments and a concerted development effort to put together an innovative 25 million dollar intermodal facility and energy park that capitalizes on existing rail capacity, access to energy and a location adjacent to the Canadian border. The city, county and regional port authority are working and investing together to make this opportunity a reality. Working together seems to come naturally in these parts. Shelby and Toole County are part of the 5-county Sweetgrass Development region (Cascade, Glacier, Pondera, Teton and Toole counties) that is working collaboratively to diversify and grow the regional economy and capitalize on its competitive advantages. Nestled together adjacent to the I-15 corridor and along the Rocky Mountain front, the five county region is well positioned to meet growing needs for domestic energy consumption in the western United States. The region’s renewable energy sources including wind and hydro-electric based power, and its significant agricultural capacity (the backbone of the regional economy) have served as a buffer in the recent economic downturn. The Sweetgrass Development organization is spearheaded by Cascade County Commissioner Joe Briggs, an affable and effective leader who along with regional partners Corlene Martin, Cynthia Johnson, Cheryl Currie, Bill McCauley, Brett Doney and Mayor Bonderud are working to set aside parochial power plays and find economic development solutions that work for the region. A common refrain is “what is good for one is good for all”. This team spirit is exemplified by regional efforts to retain and expand value-added agriculture opportunities including milling operations and packing plants and assistance in growing the regional capacity for wind energy development and transmission. The region is not driven by wind and wheat alone. The area’s numerous high-tech, knowledge-based industries such as D.A. Davidson (financial consultants), Centene (healthcare services), AvMax (aviation support and management services), Intercontinental Truck Body (truck body manufacturing) exemplify the knowledge base and work ethic inherent in the region and speak of the natural appeal of the Sweetgrass region as one component in the race to attract and retain a quality work force. A combination of “can do” spirit and strategic investments to support growing local companies and new infrastructure to feed new industries fitting with the region’s strengths place the Shelby, MT region in a strong position to beat the recession. Submitted by maymay5565 on Wed, 04/24/2013 - 06:40. The Mayweather vs Guerrero fight will be a treat for boxing fans, and I know I'll be watching, that's for sure. Godaddy Promo Codes 2012 End Of Year Specials! Submitted by pacquiaomarquez4 on Tue, 12/18/2012 - 19:31. Whenever I buy anything online I like to save, which is why I use godaddy promo codes all the time. http://PromoCodeSavings.com has the best savings anywhere. Submitted by pacquiaomarquez4 on Thu, 12/13/2012 - 15:24. Tony If you have a web site than you need hosting. Hosting can be one of the biggest expenses for a web developer, which is why hosting promo codes are necessary to save money and resources. Submitted by pacquiaomarquez4 on Tue, 11/06/2012 - 16:15. Be there and enjoy every round and watch Pacquiao vs Marquez online because it will definitely be a fight to remember. Submitted by louisejane on Tue, 09/25/2012 - 03:43. Do they have any upcoming fight for this year and compete to the pacquiao vs marquez 4 tickets as of this time? Well there's no harm in tying as the saying that goes. We don't know, maybe their tickets will be sold out too. Isn't it a great idea?